Often when I’m speaking to groups about goal achieving I talk about preparation. I like to think that the process of preparation is like filling a cup with grains of rice. 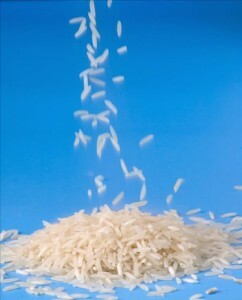 For time you spend focusing on work/training/school/relationships you get to put a grain of rice in the cup. The cup represents your goal, and the grains of rice are all the steps that you need to take to achieve it. Every time you are open to new ideas, change, challenge and co-operation you get to put another grain of rice in the cup. There is a reason that starting is the hardest part of almost any task/goal. In the beginning we have an obviously empty cup and the first grains of rice that we intend to put in look hopeless small. Goals don’t have to be huge; they can be small cups – or large buckets, even the size of your rice grains will differ – some seem minute and others massive. But there is tremendous value to each grain; added together- all your work adds up to something of value. As the grains of rice fill the cup you feel more and more ready; this is, I believe, the best way to deal with stress. Attendance alone doesn’t earn a grain of rice – you have to be present; giving 100% of what you’ve got to give and genuinely listening – not waiting to talk – which is something I’ll admit that I can struggle with. When you are stubborn, resistant to new ideas or in attendance-only-mode grains of rice are removed from the cup. Everyone will have a few of those, but it’s certainly a pile we need to keep to a minimum! Today I saw this video that uses 28,835 jelly beans to demonstrate how all of our ‘single days’ add up. When the video isolates one single bean to illustrate “your first day” my mind jumped to the cup-filling-with-rice/preparation concept. Beside all the other beans that one yellow jelly bean looked so… small – as if it could never matter; the idea of it ever becoming the pile – with all its impact – seems unfathomable. But like the grains of rice… they add up too. As you work to achieve your goals, your efforts big and small have value. Every step you take matters, first ones just as much as last ones. This entry was posted in Marnie's Adventures and tagged grains of rice, one bit more, Power of More, preparation by Marnie. Bookmark the permalink.